The crawl was followed by a view from space of the planet of D'Qar, a water-covered sphere with green land masses, where a large Resistance transport ship (with several smaller spacecraft escorting it) ascended upward from the planet. As all of the personnel at the Rebel base on the planet were frantically being evacuated, two Star Destroyers from the First Order appeared in the sky. On a third cruiser space vessel, First Order General Armitage Hux (Domhnall Gleeson) viewed the fleeing Resistance ship below them. He was following orders of the First Order's Supreme Leader Snoke (Andy Serkis, in CGI). Hux ordered the preparation of an enormous warship known as the Dreadnought, an orbital gun platform with a pair of massive cannons. It was commanded by Captain Moden Canady (Mark Lewis Jones), and instructed to "incinerate" the base, "destroy" the transports, and "obliterate" the fleet. A single light Resistance X-wing fighter of the Republic fleet, piloted by ace Commander Poe Dameron (Oscar Isaac) (with droid BB-8), approached the First Order's Star Destroyer commanded by General Hux, to taunt him, by pretending that his radio transmission was 'on hold' - and then insulted "General Hugs" with a derogatory statement about his mother. Poe attacked the Dreadnought and was eventually able with his "puny ship" to blast away both of the surface cannons at close-range. When he was assaulted by a squadron of enemy TIE-fighters flown by Deathtroopers, Poe's firing weapons system went down and BB-8 struggled to fix the short-circuits on the damaged panel. The Dreadnought's auto-cannons fired on the Rebel base, but were too late - Poe's distractions had allowed all of the Rebel transports to evacuate all of the Resistance fighters. Although ordered by General Leia Organa (Carrie Fisher) to disengage and retreat, Poe disobeyed. He was determined to continue leading a counter-attack with a squadron of Resistance bombers and destroy the Dreadnought with a direct hit. Gunner Paige Tico (Veronica Ngo) who successfully targeted the vessel with a cluster of bombs at the last possible moment, perished along with all the other bombardier crews (and the entire bomb squadron). As a result of the assault, Rebel losses were exorbitant, and only a few X-Wing fighters were left. The Resistance vessels returned to their main cruiser, and the Rebels escaped by jumping through a wormhole and entering into hyperspace at lightspeed. Runaway First Order Stormtrooper Finn (FN-2187) (John Boyega) awakened from an induced coma (after his previous injury) onboard the cruiser, and his first question to Poe was: "Where's Rey?" The last scene from The Force Awakens (2015) was replayed: scavenger and Resistance rebel Rey (Daisy Ridley) had traveled on the Millennium Falcon (with droid R2-D2 and Wookie Chewbacca) to the oceanic planet of Ahch-To where she located the reclusive "last jedi" Luke Skywalker (Mark Hamill), Leia's twin brother. She presented him with his lost lightsaber (his father's old weapon), and after he reached for it with his mechanical right hand (and human left hand), he rejected the symbol of hope by tossing it over his shoulder. Skywalker walked away to a group of primitive, monastic beehive-shaped rock dwellings in a compound constructed on the hillside. Skywalker was in self-imposed exile and refused to be recruited to help his sister Leia in the Resistance movement. Rey went to pick up the discarded lightsaber at the edge of the cliff next to some native sea-dwelling, beak-less, puffin-like birds known as Porgs, and noticed a submerged, crashed X-Wing fighter in the water. With Rey, Chewbacca broke down to the door to Skywalker's dwelling, and Luke realized that Han, his brother-in-law, wasn't with them (he had been murdered by his own son, Kylo Ren). The mighty Kylo Ren. When I found you, I saw what all masters live to see. Raw, untamed power. And beyond that, something truly special. The potential of your bloodline. A new Vader. Now I fear I was mistaken...Alas, you're no Vader. You're just a child in a mask. Ren bragged that he had killed his own father, Han Solo, but Snoke criticized him for being bested by novice fighter Rey with Luke's lightsaber (wounding him with a deep scar on the right side of his face), and for failing to locate and kill Luke Skywalker: ("The seed of the Jedi Order lives!"). After exiting the throne room, the enraged Ren bashed his helmet repeatedly against the inside of an elevator, and left it in pieces. Later as darkness fell, Rey determinedly gripped an eye-shaped object with an iris-like ring (a beacon) glowing blue in her hand, and waited outside Luke's door. She followed him up a rainy, rocky and steep cliff-face, then turned and approached a rift marked by four pointed tree trunks. She entered a hollow area below the sacred trees, and noticed a shaft of light pointed toward a collection of ancient books on a shelf ("I know this place") - she had located the island's tree library within the first Jedi temple. Luke identified what she had discovered: "Built a thousand generations ago to keep these. The original Jedi texts. Just like me, they're the last of the Jedi religion." He realized that she had the ability of seeing visions, and was possibly Force-sensitive: "You've seen this place. You've seen this island." In one of the film's most significant moments, when he asked for the second time: "Who are you?" and "Where are you from?" - she replied that she was a nobody from: "Nowhere...Jakku." She urged him a second time to join the Resistance - "The Resistance sent me. We need your help. The first Order has become unstoppable." She admitted being "afraid" of the indefinable Force within her. But he steadfastly refused to initiate her and teach her the ways of the Force. He claimed he had exiled himself on the island where he expected to die, along with the Jedi Order: "I will never train another generation of Jedi. I came to this island to die. It's time for the Jedi to end." After successfully escaping from D'Qar, the Rebel Star flagship cruiser of the Resistance (the Raddus) disengaged from hyperspace. General Leia slapped Poe's face and demoted him for his recklessness and unwillingness to follow orders: "There are things you can not solve by jumping into an X-wing and blowing something up!" Leia revealed a "cloaked binary beacon" on her wrist (similar to Rey's glowing blue object) - to communicate the fleet's location to Rey. The Rebel's new goal was to find a new base: "One with enough power to get a distress signal to our allies scattered in the Outer Rim." An alarm sounded - a "promixity alert" - Snoke's ship (a Star Destroyer named Supremacy) had improbably followed them through lightspeed with a hyperspace tracker. Poe was permitted to 'jump into his X-wing' and fight them off. Rebel pilots rushed from the bridge to combat the threat - one of whom was young and talented A-Wing Pilot Tallie (Hermione Corfield). Kylo Ren (newly-motivated after being reprimanded by Snoke) piloted his own Starfighter to lead the assault of TIE-fighters against the Resistance fleet. He swooped into the cruiser's docking tunnel and fired missiles into the hangar. The blasts destroyed most of the Resistance's fighter crafts before they even departed. The devastating explosion sent Poe and BB-8 flying backwards, but unharmed: "We need to get out of range of those Star Destroyers." On the bridge, Leia ordered Admiral Ackbar (Tim Rose, voice of Tom Kane) to proceed full-speed ahead, while deploying protective rear force shields to maneuver their faster and lighter craft away. Kylo Ren hesitated to fire at the bridge when he sensed that his mother (Leia Organa) was present - she also sensed him. Instead, his TIE-fighter escorts fired a massive blast, and Leia and her crew were sucked out into the vacuum of space without protective suits. Harnessing the power of the Force, Leia floated back toward the destroyed bridge and was rescued, although critically injured and incapacitated. Finn picked up her dropped beacon. When evening arrived on the island of Ahch-To, Chewie sat by an open fire next to the Millennium Falcon, barbecuing two porgs for dinner. Four other porgs watched him - with dismay, before flying off. A fifth sad-eyed porg chittered at him, causing Chewie conflicted second thoughts about consuming the birds. Behind him, the black-cloaked former Jedi Master Luke slipped into the Millennium Falcon. He noticed Han Solo's lucky charm and gaming device - a pair of gold-plated dice on a chain, hanging in the cockpit. He took them as a memento of his fallen friend. He briefly relived in his mind some of his past adventures with Han. The droid R2-D2 lit up and approached, and again Luke asserted: "I'm not coming back." But Luke was inspired to reconsider when R2-D2 replayed Leia's holographic message to Obi-Wan Kenobi from Episode IV. He informed Rey that he would begin her basic initiation training (three lessons) of the ways of a Jedi the next morning at dawn. The Resistance forces continued to be protected by their force shields (but there were only limited fuel supplies left), and Leia remained unconscious. Commander D'Acy (Amanda Lawrence) announced that Leia was the sole survivor from the bridge. Instead of Poe Dameron, purple-haired Vice Admiral Amilyn Holdo (Laura Dern) of the cruiser Ninka was put in command of the remaining Resistance forces (only 400 rebels with three ships) - she encouraged everyone: "And may the Force be with us." Afterwards, she confronted Poe and dismissively called him a "trigger-happy fly boy...impulsive, dangerous, and the last thing we need right now" - she derisively ignored all of his suggestions. In the escape pod hangar, Finn noticed mechanic/maintenance worker Rose Tico (Kelly Marie Tran) grieving the loss of her older sister Paige Tico, who sacrificed her life to destroy the Dreadnought. Rose was stroking a crescent-shaped medallion similar to the one that Paige had. She timidly idolized Finn, considering him a Resistance "hero" as he was trying to evacuate from the cruiser by boarding an escape pod. When she suspected that he might be deserting the ship, she incapacitated him with her hand-held stun gun. When he regained consciousness, the glowing blue beacon was on his wrist, and he begged Rose to help him direct Rey away from the "doomed" fleet, now that the First Order could follow them through lightspeed by "hyperspace tracking." She proposed disabling the "dedicated power breaker" that enabled the First Order's tracker on the Star Destroyer ship - the lead flagship Supremacy itself. They shared their secret mission plan with Poe to help the Rebel fleet escape into hyperspace without detection. Their unauthorized plan ran into one major obstacle - how could they sneak onto Snoke's destroyer without being noticed? The group received additional advice via a holographic message from ex-pirate/smuggler Maz Kanata (CGI, voice of Lupita Nyong'o), a Resistance ally. In the midst of a blaster firefight (she called it a "union dispute"), she instructed them to find a skilled Master Codebreaker (and ace pilot) in the casino city of Canto Bight ("You'll find him with a red plom bloom on his lapel rolling at a high stakes table in the casino on Canto Bight"). Ren: Can you see my surroundings? Rey: (vengeful for Han's death) You're gonna pay for what you did? Ren: I can't see yours [her surroundings]. Just you. So, no. This is something else. Master Skywalker. We need you to bring the Jedi back because Kylo Ren is strong with the dark side of the Force. Without the Jedi, we won't stand a chance against him. The Force is not a power you have. It's not about lifting rocks. It's the energy between all things. a tension, a balance that binds the universe together. During a second more serious attempt, Rey (with her eyes closed) attempted to summon the Force. She described what she saw - various opposites and dualities on the island: "Life. Death and decay that feeds new life. Warmth. Cold. Peace. Violence." In between everything was "Balance, an energy. A Force....Inside me, that same Force." Luke taught her that the "Force does not belong to the Jedi. To say that if the Jedi die, the light dies, it's vanity." I've seen this raw strength only once before, in Ben Solo. It didn't scare me enough then. It does now. He promptly ended the lesson. A small vessel - one of the escape pods - zipped away from the Resistance cruiser (with only 18 hours of fuel left), carrying Finn, BB-8 and Rose to the coastal town of Canto Bight (on the desert planet of Cantonica), to locate the Master Codebreaker (Justin Theroux). Under rainy skies on the island of Ahch-To, Rey asked Chewie in the Millennium Falcon about his unsuccessful attempt to contact the Rebels. Onboard the First Order's Destroyer, Kylo Ren looked down upon one of the hangars. Abruptly, Rey and Ren stood face-to-face and he asked: "Why is the Force connecting us? You and I." Although bonded with him, she contemptuously chastised him for all that he had done: "You are a monster." And who do you think these people are? There's only one business in the galaxy that'll get you this rich....Selling weapons to the First Order. I wish I could put my fist through this whole lousy, beautiful town. BB-8 notified them of its discovery of a "red plom bloom!" - a dapper man with slick black hair, wearing a white dinner jacket with a ruby-red brooch on his lapel, was standing at a gambling table between two females, one of whom was Party Girl Lovey (Lily Cole). However, Rose and Finn were apprehended by two Canto Bight policemen with stun guns after being reported by Slowen Lo for parking their shuttle illegally on the beach. Now that they're extinct, the Jedi are romanticized, deified. But if you strip away the myth and look at their deeds, the legacy of the Jedi is failure. Hypocrisy, hubris....At the height of their powers, they allowed Darth Sidious to rise, create the Empire and wipe them out. It was a Jedi Master [Obi Wan-Kenobi] who was responsible for the training and creation of Darth Vader. And I became a legend. For many years, there was balance, and then I saw Ben. My nephew with that mighty Skywalker blood. In my hubris, I thought I could train him, I could pass on my strengths. Han was Han about it, but Leia - trusted me with her son. I took him and a dozen students, and began a training temple. By the time I realized I was no match for the darkness rising in him, it was too late. I went to confront him. And he turned on me. He must have thought I was dead. When I came to, the temple was burning. He had vanished with a handful of my students. And slaughtered the rest. Leia blamed Snoke, but it was me. I failed. Because I was Luke Skywalker. Jedi Master. A legend. Returning to the present, Rey reminded Luke that as a Jedi Master, the Jedi Order was the last hope for the Resistance's struggle - and could provide clarity for herself: "The galaxy may need a legend. I need someone to show me my place in all this. And you didn't fail Kylo. Kylo failed you. I won't." In outer space, the Resistance cruiser was being pounded by heavy enemy cannon fire from the First Order's Star Destroyer commanded by Hux, who sensed the coming end of the Rebels: "The beginning of their end." Admiral Holdo's cowardly plan for the Resistance forces was to abandon their vulnerable cruiser using a fleet of smaller transport vessels for evacuation. Lieutenant Connix (Billie Lourd) announced that only six hours of fuel remained. Poe was dismayed by her risky and last-ditch strategy. In a cell block corridor in the police headquarters in Canto Bight, Rose and Finn were detained in a holding cell. Time was running out - her wrist com notified her that the Resistance forces were almost out of fuel. Their plan to contact the Master Codebreaker had ultimately failed. Professional slicer/hacker (codebreaker) and unprincipled burly thief DJ (Benicio Del Toro) in an adjoining bunk, who overhead Finn's and Rose's desperation, offered to assist them ("I can do it") - for a price. He stuttered: "If the price is right, I could break you into Old Man S-S-noke's boudoir." After DJ calmly released their cell door's lock, they raced after him and accepted his offer. BB-8 also helped in their escape - incapacitating the four guards. The trio fled through a manhole and sewer pipe that led up into the racetrack's fathier stables. Rose convinced the stable boy, with the gift of her Resistance insignia ring, to free all of the abused animals. As the outer doors opened, the Resistance operatives rode atop a few of the fathiers - immediately pursued by police speeders. The herd galloped on the racetrack, cut across a garden, stampeded through the windows of the casino, and raced to their ship parked on the beach, but speeders blasted their spacecraft and it was consumed in flames. After tumbling off their animals at the edge of the cliff on the outskirts of the city, Rose and Finn believed they were trapped. However, a mysterious spacecraft rose up behind them, piloted by DJ and droid BB-8 - it was a stolen luxury Star yacht with a streamlined hull, known as the Libertine that had come to their rescue. On the island, Luke made mental contact with the unconscious Leia - and appeared to re-establish his connection to the Force. Your parents threw you away like garbage...But you can't stop needing them. It's your greatest weakness. Looking for them everywhere, in Han Solo, now in Skywalker. He presented his version of the night that he burned down the Jedi Temple and slaughtered the other apprentices (a brief flashback): "He had sensed my power (as he senses yours). And he feared it." Ren claimed that Skywalker made an attempt on his life while he slept, but he defended himself with his lightsaber. I thought I'd find answers here. I was wrong. I'd never felt so alone. Kylo Ren answered her: "You're not alone" - he personally understood her feelings of years of isolation, solitude, and loss. She extended her hand toward him - he reciprocated and their hands and fingers actually touched, as they gazed into each other's eyes. At that moment, Luke (now emboldened with the Force) entered the hut and saw the two seated across from each other and bonding with their hands. He yelled out: "Stop! ", destroyed the hut surrounding them, and broke the connection between Ren and Rey. Luke: "I saw darkness. [Flashback] I'd sensed it building in him. I'd see it in moments during his training. But then I looked inside, and it was beyond what I ever imagined. Snoke had already turned his heart. He would bring destruction and pain and death, and the end of everything I love because of what he will become. And for the briefest moment of pure instinct, I thought I could stop it. [Luke contemplated killing Ben only briefly, and then relented.] It passed like a fleeting shadow. And I was left with shame and with consequence. [Ben awoke.] And the last thing I saw were the eyes of a frightened boy whose master had failed him." Rey: "You failed him by thinking his choice was made. It wasn't. There's still conflict in him. If he were turned from the Dark Side, that could shift the tide. This could be how we win." Luke: "This is not going to go the way you think." Rey: "It is. Just now, when we touched hands, I saw his future. As solid as I'm seeing you. If I go to him, Ben Solo will turn." Luke: "Rey, don't do this." When Luke admitted his past loss and failure with Ben Solo ("I was weak, unwise"), Yoda reminded him that Rey must not be lost, and offered more wisdom about the lessons of Masters: "Pass on what you have learned. Strength, mastery. But weakness, folly, failure, also. Yes, failure most of all. The greatest teacher, failure is. Luke, we are what they grow beyond. That is the true burden of all Masters." On the Libertine flying at hyperspeed away from Canto Bight, DJ (recruited as a Codebreaker) bargained for an up-front 'deposit' of Rose's golden medallion pendant (with great sentimental value) hanging around her neck. They discovered the owner of the stolen Libertine was a "bad guy" arms dealer. DJ's philosophy of life about choosing sides was "Live free, don't join." The Resistance's main cruiser was the last remaining vessel in the fleet. Poe was aggravated by the lack of leadership provided by Admiral Amilyn Holdo, whose only cowardly plan was to fuel the transports (unarmed and unshielded) to evacuate the remaining Resistance members and then abandon ship. Poe was adamantly in disagreement: "If we abandon this cruiser, we're done. We don't stand a chance." Finn communicated with Poe that they were approaching the First Order's Destroyer, the Supremacy, to shut the tracker down with their codebreaker. And on the Millennium Falcon speeding back, Rey prepared and then launched herself in an escape pod toward and into Snoke's flagship the Supremacy, where she was greeted by Ren and two Stormtroopers with handcuffs and taken to Snoke's throne room. Meanwhile, the stolen Libertine slipped undetected into the interior of the First Order's cruiser. Poe notified Admiral Holdo that the evacuation plan and loading of transports needed to be delayed, to give more time to Finn, Rose, DJ, and BB-8 to infiltrate the First Order's flagship. When she refused, Poe commandeered a mutiny (joined by Lieut. Connix and C'ai Threnalli (Paul Kasey) and others), arrested Holdo and her senior staff, and took control of the bridge. Inside the flagship, Finn, Rose and DJ entered an automated launderette, stole First Order officer uniforms and disguised BB-8 with a trash-can. The intruders on their way to the hyperspace tracker were detected by a First Order astromech droid BB-9E using thermal vision. On her way to appear before Snoke, Rey told Ren that she sensed the conflict within him: "When we touched hands, I saw your future. Just the shape of it, but solid and clear. You will not bow before Snoke. You'll turn. I'll help you." He disagreed: "When the time comes, you will be the one to turn." He described the vision he had of her parents. In the throne room, Snoke praised his apprentice for bringing Rey to him. While Poe took command of the cruiser's bridge (ready to jump the Raddus to hyperspace), the detained Admiral Holdo in the hangar snatched a blaster away and opened fire at some of the mutineers. DJ was able to break into the inner chamber of the tracker room, but they were apprehended by Stormtroopers alerted by BB-9E, led by chrome-armored Captain Phasma (Gwendoline Christie) who gloated and welcomed deserter Finn back. As Poe was listening in to their failed mission, the ship's bridge door was blasted open. An awakened Leia hobbled in and stunned Poe with her blaster to end the mutiny and resume command. The cruiser's transports were readied for the beginning of the Resistance's evacuation, while Holdo volunteered to stay behind and pilot the cruiser single-handedly. It was I who bridged your minds. I stoked Ren's conflicted soul. I knew he was not strong enough to hide it from you. And you were not wise enough to resist the bait. And now, you will give me Skywalker. Then, I will kill you with the cruelest stroke...Give me everything! The cloaked transports would hopefully be unnoticed as they headed to the mineral planet of Crait, an "uncharted hideout" with a heavily-armored but abandoned Rebel base, that could enable the transmission of a distress signal to their allies in the Outer Rim. Leia admitted to Poe that she was approving of Admiral Holdo's retreat and evacuation plan. They watched as the cruiser was taking on enemy fire, where Holdo had sacrificed herself. The captured Finn and Rose were brought into the presence of General Hux. The traitorous "lying snake" DJ had betrayed them to Captain Phasma for a deal - the reward of his own freedom. DJ had also revealed that transports were departing from the cruiser. The First Order had performed an uncloaking scan and the 30 Resistance transports began to be fired upon. In front of squadrons of Stormtroopers and other First Order officials, Finn and Rose were to be executed. At the same time, Snoke promised to exterminate Luke: "After the Rebels are gone, we will go to his planet and obliterate the entire island." Through telekinesis, Rey summoned and grasped her light-saber from behind Snoke's throne, but his overwhelming power brought the lightsaber back to him. She was propelled forward and held in mid-air to witness (in a magnifier) how the Rebel transports were being eliminated. Then, Rey pulled Ren's lightsaber into her possession, but was forced backwards when she charged at Snoke with the weapon and the lightsaber landed at Ren's feet. Now, Ren - addressed as "my worthy apprentice, son of darkness, heir apparent to Lord Vader," was ordered by Snoke to execute Rey, to complete his training and fulfill his destiny. Ren retrieved his lightsaber from the floor and was resolute: "I know what I have to do" - unexpectedly, he stealthily (with the power of the Force) activated the blade of Luke's lightsaber sitting on the throne behind Snoke, and bisected the Supreme Leader in two at the waist with it. Then, Rey (with Luke's lightsaber flying into her grasp) and Ren (with his own lightsaber) cooperatively fought off Snoke's attacking red-uniformed guards. At the end of the melee, Rey threw her lightsaber to Ren to save him. they were insignificant "filthy junk traders"
as a child, they sold her off for "drinking money"
"You have no place in this story. You come from nothing. You're nothing"
He entreated her again to join him - with an extension of the open palm of his hand. Both of them attempted to use the Force to reach for Rey's lightsaber, and it hovered in mid-air between them in a stand-off as they struggled for its possession. Eventually, the lightsaber snapped and broke into two pieces, released energy from the explosion, and knocked the two backwards - Ren lay unconscious. One by one, as the escaping Rebel transports were being incinerated in space, Admiral Holdo took the command chair of the Resistance's cruiser, and prepared to jump to lightspeed to escape (with the last remaining fuel reserve). From their transport, Poe and Lieutenant Connix watched as the Raddus cruiser veered away, but then turned to face the Destroyer the Supremacy, and self-sacrificially rammed into it at lightspeed. The collision broke the Destroyer into two and caused a violent explosion. From their transport, Leia and Poe watched Holdo's demise, and then proceeded onto the planet of Crait. At the impending execution of Finn and Rose, Captain Phasma thought that blaster bolts would be lost of them: "Execution by blaster is too good for them. Let's make this hurt." Phasma ordered two First Order Stormtrooper executioners to wield laxer axes and behead them. When the Destroyer broke into two from the collision, Finn's and Rose's executions were violently interrupted, and they raced from the burning wreckage toward a shuttle, where they were fired upon by Captain Phasma and other surviving Stormtroopers. However, BB-8 commandeered a Scout-AT-Walker and saved them, and after a duel between Finn (with a laser axe) and Phasma (with a spear), the Captain perished when she fell into a fiery chasm as the floor collapsed beneath her. As Ren lay unconscious, Rey escaped in Snoke's escape craft and flew toward the Resistance base on Crait. When Ren regained consciousness in General Hux's presence (who was about to execute him), Ren blamed Snoke's murder on Rey: "The girl murdered Snoke." And then assumed command: "Get all our forces down to that Resistance base. Let's finish this." When Hux refused to accept Ren's orders to prepare a ground assault on Crait, Ren used the Force to choke Hux into submission, and then declared himself the new Supreme Leader. On the frozen, salty (red) and rocky terrain of the planet Crait, at the partially-opened door of the sheltered Rebel base (an old mine, populated by crystalline-furred foxes), General Leia awaited the arrival of other survivors. Finn, Rose and BB-8 crash-landed in a stolen tri-winged shuttle while escaping from pursuing TIE-fighters, and were protected behind the base's towering thick metal door. But once inside, Rose was dismayed: "Is this all that's left?" They had only "rotted munitions, rusted artillery, and some half-gutted ski speeders." Shields were deployed around the base, and a distress signal was sent to all allies in the Outer Rim. Finn was worried that the base was about to be assaulted by advanced First Order weapons, led by "battering ram cannon...a miniaturized Death Star tech" with super-lasers to penetrate through the door of the Crait outpost. Two rows of trenches and a number of towering turrets with mounted cannons defended the base as incoming First Order ground forces approached. Old, low-altitude ski speeders (Finn, Poe and Rose piloted three of the thirteen "rust buckets") soared out from flaps in the base's giant door to join the ground assault, each extending a stabilizer strut-ski for balance. A row of First Order AT-walkers (armored transports) and a squadron of TIE-fighters returned fire. One of the walkers held Ren and General Hux who observed the conflict, with Ren in charge. Suddenly, the Millennium Falcon joined the fire-fight - Rey was in the gunner's bay while Chewie was flying the vessel (with a frightened Porg sitting on the console). The Falcon drew the TIE-fighters away from the speeders, and flew through one of Crait's crystalline cave shafts to evade fire. Nonetheless, the speeders suffered heavy losses. We fought till the end. But the galaxy has lost all its hope. The spark is out. A silhouetted, hooded figure entered a doorway into the command center - it was Jedi Master Luke who had suddenly arrived to apologize to her. His goal was to come face-to-face again with his nephew Kylo Ren: "I came to face him, Leia." Although she wasn't hopeful, Luke held out hope for her long-lost son: "No one's ever really gone." He placed in her hand Han Solo's lucky gold dice on a chain, and then entered the breached outer door of the base to confront Ren. From an AT-walker control room, Ren ordered a massive volley of turbolaser fire from the AT-walkers, an assault specifically directed at Luke. The Resistance fighters witnessed the barrage. When the red-tinted smoke cleared around him, Luke stood before everyone - unscathed, and mockingly brushed some debris from his shoulder. Meanwhile, Finn dragged Rose inside the base for medical care. Kylo Ren's shuttlecraft landed in front of Luke, on the red-salt plain in front of the base - and the two confronted each other. Ren attacked with his red-bladed lightsaber against Luke's blue-bladed saber. Luke's stalling tactic allowed time for the Resistance fighters to escape from the mine, first noticed by Poe: "We are the spark that'll light the fire that'll burn the First Order down. Skywalker's doing this so we can survive." Poe realized that the crystalline-furred foxes could be followed through a passage to an unmapped exit. Meanwhile, Rey in the Millennium Falcon, realized through the blinking of her blue-beacon, that the Rebels were just below her. She landed the craft, and then noticed how a mound of rocks blocked their exit - and with the power of her outstretched hand (and the Force), she miraculously cleared the mine's pile of rocks by lifting the gigantic boulders. Luke: (apologizing) I failed you, Ben. I'm sorry. Ren: (angrily) I'm sure you are! The Resistance is dead. The war is over. And when I kill you, I will have killed the last Jedi. Luke: Amazing. Every word of what you just said was wrong. The Rebellion is reborn today. The war is just beginning. And I will not be THE LAST JEDI. Ren: I'll destroy her, and you, and all of it. Luke: No, strike me down in anger and I'll always be with you. Just like your father. After Luke invited Ren to strike him down, Ren raced at Luke and swung his lightsaber at him through his torso, but the laser blade passed through him with no harm. Luke's body was only a non-corporeal, ghostly projection of his real physical body, still on the island of Ahch-To - seated in a cross-legged meditative pose. Luke bid his fallen nephew goodbye before his projection faded from view: "See you around, kid." After using the Force to produce his projection, Luke was sapped of strength, exhausted and weakened, and he collapsed on a rock slab. He slightly rose up and stared at Ahch-To's blazing setting suns on the horizon, breathed deeply, and then slowly faded away completely - he had become one with the Force. On Crait, Rey and Leia sensed Luke's passing away. The surviving Resistance fighters fled from the base through the rock opening and boarded the Millennium Falcon to escape. As Kylo Ren and Stormtroopers entered the evacuated mine, they were dismayed to find the command center empty. Ren located the discarded dice of his father on the floor, and as he stared at them in his hand, they disappeared. Rey: How do we build a Rebellion from this? Leia: We have everything we need. In the final scene on Canto Bight, the brown-haired young stable boy who had helped Finn and Rose escape, listened as another stable kid (Joshia Oniha) spoke in an alien language while relating the legendary adventures of Luke Skywalker. Using props on the dirt floor, the boy described how the Jedi Master had helped to defeat the First Order forces at the Battle of Craig. He mentioned the name of the last Jedi: "Luke Skywalker, Jedi Master" - the final line of dialogue in the film. They were interrupted by the appearance of their angry, iron-fisted, alien Cloddogran overseer and fathier trainer Bargwill Tomder, who ordered them back to work with his whip. Outside, the brown-haired stable boy summoned a broom propped by the door - with the Force - to glide into his hand. After sweeping some hay, he hopefully gazed upward to the skies. The camera revealed Rose's Resistance insignia ring on his finger. This was the 8th film in the entire saga, and the second installment of the Star Wars Sequel Trilogy. The events in this film followed what had occurred in the previous film. It was set thirty years after the conclusion of the original Star Wars trilogy. Although well-received for the most part, it was considered bloated with too many extraneous story-lines, and should have been cut down by at least 30 minutes of its run time. This was the fourth Star Wars film to be released in IMAX. Nominated for four Academy Awards (with no wins): Best Visual Effects, Best Original Score (John Williams), Best Sound Editing, and Best Sound Mixing. This was Carrie Fisher's final film (to portray Princess/General Leia Organa) - she died at the age of 60 on December 27, 2016, about one year before the film's premiere in Los Angeles on December 9, 2017. It was released on the 40th year anniversary of the release of the original Star Wars film in 1977. According to the indie writer/director Rian Johnson, the film was inspired by a number of dramatic adventure or war films, including Twelve O'Clock High (1949), The Bridge on the River Kwai (1957), Letter Never Sent (1960, Soviet Union), and Three Outlaw Samurai (1964, Jp.). At the time, it was the longest of the eight Star Wars Saga films, at 152 minutes. The previous record was held by Star Wars: Episode II - Attack of the Clones (2002) at 142 minutes. With a production budget of $200-217 million, and box-office gross receipts of $620.2 million (domestic), and $1.33 billion (worldwide). It was the highest-grossing (domestic) film of 2017, besting second place Beauty and the Beast (2017) at $504 million. 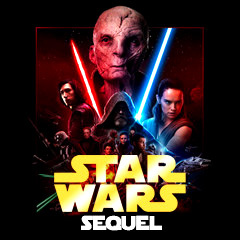 Of the entire Star Wars franchise of 8 films (to date), it was the second highest-grossing (domestic) film of the series (behind The Force Awakens (2015)). At the time, it also had the second highest-opening weekend of all time, at $220 million, just behind the first film of the trilogy, The Force Awakens (2015) at $248 million. Set-pieces: the attack on the First Order's Dreadnought during the Resistance's evacuation of D'Qar, the First Order's assault on the Rebel flagship cruiser after it disengaged from lightspeed - led by Kylo Ren - and the destruction of the bridge, the fathier stampede through the Canto Bight casino and escape to the Libertine, Kylo Ren's and Rey's light-saber battle in Snoke's throne room against his elite guards after the killing of Snoke, the cross-cutting between the simultaneous collision of the Raddus into the First Order's Destroyer the Supremacy as Ren and Rey struggled to possess Luke's lightsaber and Finn and Rose were about to be executed, the duel between Finn and Captain Phasma, and the concluding Battle on Crait including the lightsaber duel between Luke and his nephew Kylo Ren.